We promise that our Pilates studio's philosophy of "Individualized Attention - Each Time, Every Time" will give you the best opportunity to achieve your goals, improve your life, and look your best! *New Clients only. Excludes Pilates for Dancers program. We can't stress this enough...it really differentiates us from all the other Pilates studios in the SCV! Even in our Pilates group classes, the attention you receive will always feel like a private Pilates appointment. We don't ever teach Pilates from the front of the room, we are always hands on, and you'll always know we are paying close attention to everything you do. For more about our Pilates classes, click below. Pilates can Rid you of that Back Pain! Is your back pain is preventing you from enjoying daily activities with your loved ones or even from working? Is it preventing you from exercising or playing your favorite sports? If so, our Pilates programs are perfect for you! Pilates is especially effective for back pain relief! It lifts, lengthens and aligns your spine, all while doing so in ways that prevent injury. Your core abdominal muscles will become stronger, and with that new strength and alignment, your back pain will virtually vanish! Contact us today to find out how we can help relieve or eliminate your back pain! Pilates & Barre can help you lose that weight and gain back your life! Our Pilates & Barre programs are the BEST way to get back into exercise! Have you found yourself unable to live your life the way you used to before weight gain? Pilates safely builds your core (while avoiding injury), which quickly allows you to feel yourself getting stronger and standing taller. This instantly makes you appear slimmer and that extra confidence implores you to work harder! Once that ball is rolling, you'll even be making better choices about what you eat! We've made our studio a private, caring environment, where you have no need to ever be embarrassed and will only feel loved and special. Please contact us today so we can how our Pilates programs can work for you. Seniors...Pilates can improve your life! Unlike most Pilates studios who tend to shy away from seniors, we think it is absolutely incredible when our seniors come to class! Have you noticed that your balance is off? Do you have trouble with daily life activities (like getting up off the floor)? Can you still climb a step stool to reach things? Have you been diagnosed with Osteoporosis or muscle loss? We've created special pilates training specifically to help you significantly improve all of these, and to help you regain your ability to do the activities most of us take for granted. Contact us today for more information about our Pilates for Seniors programs! Pilates maximizes your current fitness regime! Our Pilates programs are the perfect way to maximize your other types of training! Pilates increases your body awareness...and that awareness is essential if you are to do other forms of exercise without getting hurt. The improved core strength brought about by our Pilates programs will also help you maintain form and posture as you do other types of training, You'll find that our Pilates training will help you to build your overall level of fitness, correct muscle imbalances, increase your focus and awareness, and will help you recover from muscle strain or injury. Amp up your training today! Contact us for more details about our Pilates programs. Are you in significant pain after doing cardio? This is often because you are doing exercises designed for the "masses" that aren't individualized for your own body. Pilates is the exact opposite...it allows you to workout just as hard (or even harder), but protects you because the movements are better suited for your body. At Complete Pilates & Fitness, we've utilized Pilates methodology to design classes, like Pilates Barre None and Pilates Jumpboard Burn & Sweat, to allow you to get an incredible calorie-crushing Pilates cardio workout, without high impact and high risk moves normally associated with other forms of cardio and cross-fit training. Contact us today for more information about our Cardio classes. Ok ladies, we've all been there. Although we know we need to exercise during and after pregnancy, we are so tired and uncomfortable...and have really never found an exercise program that hasn't made us even more uncomfortable or self-conscious. We can say, from first-hand experience, because Pilates is based on your own body, it is the perfect pregnancy exercise program because it changes as your body does, both during and after pregnancy! We'd love to share more about our personal experiences in this area...come visit or call us soon to learn more about Pilates and pregnancy / post pregnancy! Here's an area where we really shine! Having been trained by one of the top authorities on the subject, Karena Thek, author of Scolio-Pilates, we utilize an approach where we balance your anatomy through the use of wedges and small lifts, allowing you to exercise in optimal alignment. This then strengthens your muscles that have been weakened due to the imbalances created by your Scoliosis and/or Kyphosis, and coaxes your tight muscles to stretch and be more responsive. With consistent visits, we've seen some truly amazing and life-changing results! Ages 13-up. Please contact us below for more information on Pilates for Scoliosis. We are the ONLY dedicated Pilates Studio offering super affordable Pilates for Dancers classes! Suzi's background in both professional Dance and Pilates allowed her to create an original workout geared to improve every aspect of your dancer. Watch your dancer's balance, extension, and strength improve with every session! This improvement also gives your dancer incredible confidence and body awareness! 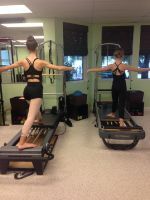 Come see why we are the BEST Pilates & Barre studio in the Valencia area! NOW - BRING A FRIEND FOR FREE!